Bring back childhood memories with the Financiers, Cake and Pound Cakes Workshop at Le Cordon Bleu Paris institute. In a friendly and professional setting, you will make the authentic pastries and cakes of your childhood which, still today, remain firm favourites. The objective of the Financiers, Cake and Pound Cakes Workshop is to teach you the techniques and secrets to making financiers, cake and pound cakes, with an inimitable flavour, by using your practical skills. This workshop is suitable for both pastry beginners and those with experience. Six hours of lessons to become a real cordon bleu, whatever your level. 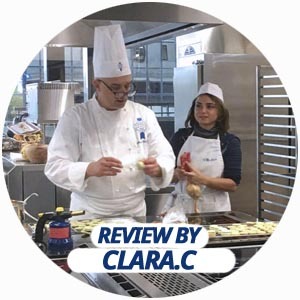 Following the advice of an experienced Le Cordon Bleu pastry Chef, each participant will make the recipes mentioned below. This workshop is limited to 16 participants. You have your own dedicated workspace to make your favourite cakes. Aprons at the ready for this most delicious of afternoon teas! Le Cordon Bleu Paris team of renowned and experienced pastry Chefs are keen to share the know-how and techniques necessary for making financiers, cakes and other pastries during the workshop. This cake takes its name from the equal portions of butter, sugar, flour and eggs used to make it and which have also given rise to its originality and popularity.